It took two days to hear anything from T&I. Raidou managed to stay sane, just about. Shibata’s advice anchored him: Hatake’s loyalty — and Shiranui’s, Tousaki’s, and Ueno’s — isn’t lightly earned, Captain. Let that rest in your mind. It certainly made an impression in mine. Whenever he felt himself slipping into worry and doubt, Raidou lifted that thought like a shield. My team has faith. The meeting had yielded another thing, too, after some time to mull it over: he liked the head of T&I. Shibata Tomohiro was a scary, scary man, but he’d still treated Raidou with surprising gentleness, and only kicked Raidou to knock down old, crippled armor that wasn’t helping anymore. He’d left Raidou with hope. I’ve yet to find a well-forged weapon so dull it couldn’t be sharpened. So Raidou filled his time with hard training, eating wholesome food, reading every book on genjutsu and trauma therapy he could get his hands on (when Shun ran out, he went to the jounin library and checked out as many new volumes as the suspicious librarian would let him carry), doing chores around his mothers’ house (there were many), sleeping, and waiting. “The Hokage requests your presence at 1130,” she said perfunctorily. “Outside,” he said. He’d finally convinced Ume to go back to work, but Shun would still sense the presence of an outsider in the home, even after the fact, and they’d both been disturbed enough. Lizard melted back into dappled leaf shadows. Raidou left her to lurk while he went inside to shower and change. 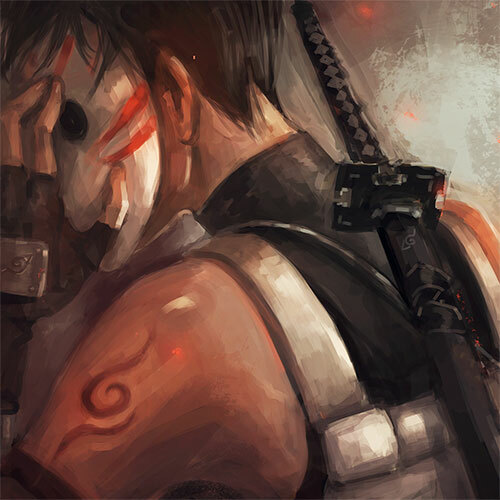 An ANBU uniform felt presumptuous; he opted for jounin blues and made an effort to be presentable. He didn’t think the meeting would take all day, but he left a note stuck to the fridge just in case. Got summons. Do not march on Hokage’s office if I’m not back before dinner. I AM FINE. P.S. Don’t send any notes either. Lizard had no discernable reaction to his uniform choice. She led him to the Hokage’s palace in complete silence, darting swiftly and invisibly along the rooftop route. She reminded him of Kakashi: all efficiency, zero social skills. Except Kakashi would’ve added biting commentary. The waiting room outside the Hokage’s office was at half-occupancy already, polished wooden benches filled with waiting diplomats, mission clients, and shinobi of various ranks. Two masked ANBU flanked the office doors. One of them had stocky, freckled shoulders rippling with muscles, and a familiar rabbit mask. Raidou blinked at Usagi, and thought he saw the flicker of a wink returned through one shadowed eye-hole. The other mask was a series of stylized orange swirls across white porcelain, still glossy with newness. One of her rookies, then. He wondered if it was the one she’d punched. At Lizard’s pointed gesture, he took a seat on one of the free benches. Lizard vanished without a word, presumably to inflict awkwardness on someone else. Time passed slowly, measured by the drift of the sun outside the windows, and the impatient creaking of civilians shifting in their seats. Some people — the diplomats, mostly — had appointments. For the others, it took money or a genuine crisis to see the Hokage directly. Regular mission clients were usually D- and C-rankers who got shunted straight to the mission office. Anyone who’d actually made it up to the palace was squeezed into the Hokage’s schedule wherever they could fit, sometimes at the expense of a dignitary. People trooped in and out of the office doors. A few left looking relieved, even pleased; most didn’t. A moment before Raidou’s internal clock nudged him, the outer doors to the hallway opened and a sudden hush descended. Sagara cut through the room like a barracuda, pausing only to exchange a swift, quiet word with Usagi before she was shown immediately into the Hokage’s office. Less than thirty seconds later, Shibata strode in, black coat swirling behind him. His entrance reduced any returning noise to absolute silence. He glanced once around the room, spotted Raidou, and offered a pleasant, warping smile that made someone swallow audibly. Usagi didn’t exchange any conversation with him; she simply held the door open, and closed it again after he stepped through. The rookie’s naked shoulders had gone a shade paler. Raidou breathed through a curl of tension and thought, My team has faith. A moment and an eternity later, the door opened again and Usagi beckoned him up. Every eye followed him as he straightened his back and walked forward. “What the hell did you do?” she hissed, nearly soundless, when he passed her. “Tarred and feathered Hatake,” Raidou murmured back, and carefully shut the door before she could press for details. The Hokage’s office looked the same as it had a month ago: a long, dark-panelled room with a soaring view of the village. The windows were large and curved, following the circular outer wall. An intricately patterned runner carpet guided visitors from the door to the Hokage’s desk, which was the only piece of furniture in the room, aside from the Hokage’s chair. Minato was already seated, morning sunlight glinting on his fair hair. His official hat of office was hanging from the back of his chair. Sagara stood on his right side, hands held crisply behind her back. Shibata was on his left, standing relaxedly on one hip. “How have you been sleeping?” Minato asked. Shibata chuckled softly, as if that pleased him. “Is the team being sent on another mission?” Raidou asked. If the answer was ‘yes,’ he wouldn’t know how to stay down on one knee. If Ryouma put himself in deliberate danger while the rest of his team was struggling to heal, Raidou would knock him over the head. Additional funds. Minato was cutting into the village’s narrow resources, along with revenue diverted from a bounty that Konoha could surely have used. Sometimes ANBU soldiers were called the Hokage’s dogs. This would be the choke-chain. “Yes, sir,” Raidou said quietly. Raidou stared at him. The Yuuhi clan was small, but respected, and Yuuhi Benihime had ruled it with an iron fist for the past five decades. She’d been a legend in more than one war, and was renowned for devoting her quasi-retirement to finding and training the most promising genjutsu students Konoha had to offer. Protégés from other villages travelled for days purely to sit at her knee and learn for an hour. Raidou was going to offend her just by existing. He opened his mouth, but couldn’t quite work up the nerve to ask Shibata if he’d entirely thought this through. He closed his mouth. Team Six. Raidou’s career. One chance only, no encores. No more Tsurugahama Ports, ever again. Raidou closed his hand around the scroll and took it firmly. “I know, sir.” At a subtle flicker of permission from the Hokage, he got back up to his feet, straightening his shoulders, and found himself looking down at Shibata. It didn’t change much; Shibata had the kind of presence you could fold steel around. The T&I commander tipped his head back ever so slightly, looking up at Raidou’s face. “Good. I don’t like to be proved wrong.” With that, Shibata turned and retook his place at the Hokage’s side. “I’m still waiting for confirmation,” Sagara said, closing the topic like a book. There was nothing Raidou could do but tuck the scroll under his arm, salute, and leave. Immediately, he went to find Genma.